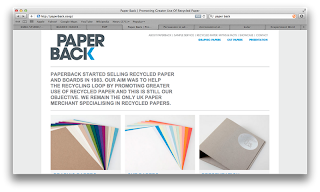 Today I phoned paperback for a sample pack of papers to be sent for the Lauren Carande brief, this company sources recycled paper stock in a range of weights and colour, hopefully i should get this for thursday to discuss with Lauren. They also include infer on each stock how ethical each one is and include facts on recycled paper which would be interesting to show Lauren when making her choices on stock, to see if this had an effect on the stock she would choose. cleaning involved, but …….. pulp does not grow on trees! more chemicals and is often more polluting than making recycled paper. 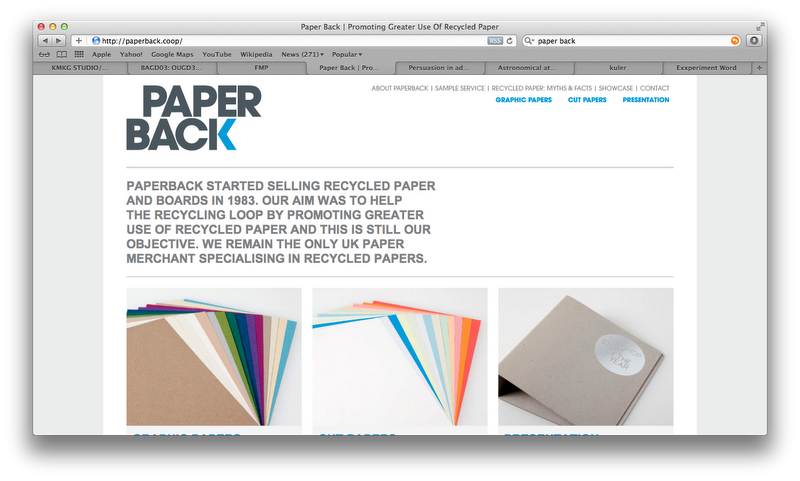 of virgin paper, 1 tonne of recycled paper can save 1.32 tonnes of CO2 equivalent. Most recycled papers require little if any bleaching. lightly printed (e.g. computer) waste paper. or De-inking – this is more a mechanical than a chemical process. A detergent (usually phosphate free) is used to dissolve the ink. the pulp. Ink sticks to the bubbles and rises to the surface where it is scooped off. either burned, turned into soil conditioner or safely disposed off. Where bleaching is used, almost invariably chlorine-free agents are used. waste. It is obviously better to recycle this (and retain the carbon) than to burn it. …. and in areas where clear-felling is practised, it can lead to soil erosion. 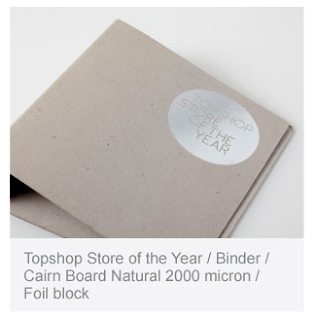 specify papers made with FSC (Forest Stewardship Council) certified content. virgin equivalents, not just in their performance, but even in their appearance.